The needle point lace of Brussels is known as Point a l'Aiguille and Point de Gaze. The bobbin lace is sometimes named Point Plat or Flat Point,the word point in this case signifies the fine quality of the lace, and has nothing to do with the needle point. Point "Plat Applique" is the name given to Belgian bobbin made sprigs which are after­wards applied to machine-made net. The term "Point d'Angleterre", as applied to a Belgian lace, recall an interesting page in the history of Brussels lace. The thread used in making Brussels lace is of exquisite fineness ; the flax for its manufacture is grown in Brabant; it is cultivated for lace-making at St. Nicholas, Tournay, and Courtrai. The steeping is done in the Lys, the river close to Courtrai, which gives better results than any other water. Every aid which can be devised is rendered to the spinner. A background of dark paper is placed where it will best show up the thread as it is drawn from the distaff, and the room is so arranged that a single ray of light is thrown upon the work. Even with this assistance the spinners rely upon the " feel " of the thread as it-passes through their fingers, rather than upon the sight of what is so fine as to almost escape their eyes. The earliest Point a 1'Aiguille patterns resembled those of ancient Point de Venise. Lace appears to have been first made in Brussels in the fifteenth century, and a few rare specimens are still preserved in the old churches of Brabant. The designs were taken from the early Genoese Guipures in Gothic style. 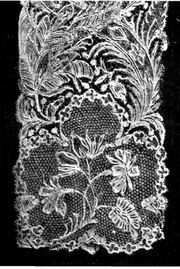 The designs of Brussels laces have always followed the fashions, which, indeed, affected lace in every part of Europe. The most ancient style was Gothic or Geometric. Then came the stately and flowing Renaissance lines which were used until the simplicity in all fabrics at the time of the Revolution demanded less ornate designs. The first Empire fashion demanded semes or powderings of spots, insects, or tears, together with small floral borders and wreaths. Since 1830 the patterns have become more floral, the flowers themselves following the lines of nature closely and being less conventional. Many sprays display flowers made of needle and bobbin lace mingled together. These are frequently mounted on machine-made net. The Brussels flowers are of two kinds, needle-point and those made with bobbins ; both these are made separately from the grounds. In old Brussels lace the ground was worked with bobbins round the flowers. Later the flowers were sewn into the ground. This method obtains in the present day. Sometimes the flowers are sewn on to the ground. The modes connecting Brussels lace designs are most elaborate, as are the fillings or intricate stitches. Relief is given to the outlines of the flowers and fibres of leaves by a raised plaited cordonnet in the bobbin laces ; in the needle-point lace the cordonnet is not covered with button­holing. The current method is to make the lace in separate pieces; one worker makes the flowers, another "hearts" them, that is, adds the intricate centres and the open work, or jours. This method, though it ensures perfection in the working of each separate stitch, does not encourage individual artistic effort, for it is the master alone who selects the ground, chooses the thread, and knows the effect the whole will produce. He it is who chooses the design, pricks it into the parchment, and cuts this up into pieces, handing each piece ready pricked with a section of the pattern to the special worker whose business it is to put in the stitches of which she is the best exponent. Sometimes, however, in the smaller lace factories, single workers undertake the whole process. Machine-made net has been used for the application of Brussels flowers and sprigs since the invention of machinery for making net; but no ground yet invented is superior to the needle ground. This is worked in strips not more than an inch wide, which are joined to the required size by a stitch known to the lace-makers of Brussels, Alencon, and Venice only. This is the point de raccroc, or fine joining which cannot be distinguished from the net itself. Thetraditional reseau is now seldom made; it is stronger, but three times more expensive than the bobbin ground. It differs from the Alencon ground in being a simple looped stitch instead of being whipped a second time as in the French variety. In the bobbin-made Brussels ground, two sides of each hexagonal mesh are formed by four threads plaited, and the other four sides by threads twisted together. A magnificent collection of the needle-point ground lace was presented to Josephine on her first public entry into Brussels with Napoleon. has one great defect that of discolouration. In order to conceal the brownish tint of the needle-point sprays as they come from the hands of the workers, the workwomen place the flowers in white lead powder, and beat them with their hand to whiten the flax. This operation is extremely dangerous to the worker, who frequently contracts lead poisoning from inhaling the injurious powder, and also makes the lace turn black when exposed to sea air or to heated rooms. This black tone can never be removed. Lime is occasionally used to whiten discoloured lace, but this means absolute destruction of the fabric by burning when water is applied. In 1662, the English parliament was so alarmed at the effect on English trade of the large quantity of lace imported into England, that English laces were protected by Act of Parliament, and a law was passed forbidding the importation of foreign laces. The English lace merchants were determined not to be deprived of their lucrative trade, however, as large quantities of lace were required in order to supply the extravagant court of Charles II, so it came about that Belgian lace was first called Point d'Angleterre, for under no other name would its sale in England be legal. The merchants combined, bought up all the finest lace in the Brussels market, and, smuggling it over to England, sold it under the name of English point; and so the mistaken idea arose that all Point d'Angleterre was made in Belgium, and that it originated in that country: the chief portion of the finest Point d'Angleterre was made in England.